With the Internet so easily available nowadays, I decided (just for the fun of it but also out of curiosity) to do a Google search to see how many entries 1 could find for "heritage and history". In a split second no fewer than 840 000 results appeared. I felt exhausted even before I even started surveying the results. This gives a sense of how history educators must sometimes feel when they have to teach content or facilitate, but still have to find the time on a daily or weekly basis to engage with meaningful ideas and activities as part of the History curriculum. This is especially true for heritage assignments that from 2012 will, among others, be the focus in the Grade 10 History curriculum.  Gives some concluding suggestions on heritage, history and the History curriculum. Although heritage topics - with their always highly debateable associations with history and memory - are not part of my daily professional focus and concern, I also from time to time stumble on their inevitable presence in the recording of local and regional history. When doing so, and also with preservation of the local environment at the back of my mind, I am more often than not aware that history educators from all the provinces, and from particular regions and localities, can do so much more to support awareness of local history2 and local heritage3 as a form of identity.4 Through practical means (for example learner assignments that can also be linked to most History curriculum themes, and are thus not "wasted") this activity could contribute to preserving local history (as a non-negotiable foundation to support the understanding and appreciation of local heritage). These inputs could eventually expand the archived memories of their own area that responsible institutions of local areas preserve or that are archived elsewhere. The point I am also making is that local history and local heritage preservation cannot be the task only of local or national government or a limited number of local historians/heritage-preservation organisations in our country. Therefore heritage education will (and should) have a place in History curricula once History educators are willing to provide space to previously neglected or marginalised narratives as a living (intangible) or visible (tangible) heritage. Heritage is not only to be explored occasionally or mostly ignored, but must be passionately and constructively engaged with inside and outside classrooms and lecture halls (as so many educators pointed out during the SASHT 2010 conference). As heritage will always have the appearance of being in motion (and is not fixed)5 its "acknowledgement" in formal history education could and should rather be used as human experiences that support the making of any history, or as a tool contributing to the understanding of expressions of the broader past. The professional engagement which I, and other historians, have is then to record local histories (this could be approached from various angles such as economic, religious, educational, environmental, etc.) so that History educators and others can also use these contents as fundamental historical contexts, for example in heritage assignments. Another personal engagement (at least in this writing) is to make History educators aware of the fact that the broader History curricula of the General Education and Training (GET) and Further Education and Training (FET) phases do not "ignore" local history and local heritage. Their "useability" and "practicality" in the teaching of History curriculum themes lie in the way the History educator methodologically structures his or her theme content so that learners, for example, can understand international events through local examples, and vice versa. The rest of the discussion will be devoted to this "second" engagement, with the point of departure being some form of conceptual understanding, and then exposing history educators to some practicalities and local South African sources that they can use to enrich their local history research and heritage activities for History learners. It is generally known that perhaps no national history and memory can be representative and/or complete without considering some milestones in local historical events that sometimes contribute, or have contributed, to mind-shifting decision making at all levels of authority and in the community. Although these events may be associated only with one particular group, community, race, gender or even age group, contributions (historically recorded, or through oral/anecdotal memories or visual expressions as heritage), they remain part of the local and also the broader national history. To my mind local history and local heritage in the 21 st century should not be ignored or "de-balkanised" (a term used by a speaker during the SASHT 2010 conference) to support notions such as "rainbow nationalism".6 Exploring local histories in the knowing, using and appreciating of heritage and history in general (but certainly for History educators exploring a history theme in a History curriculum in an all-inclusive way)7 may spontaneously pave the way for "nation building".8 Thus it is a form of open-minded approach that may perhaps contribute to another second form of identity among all, which features traces of "rainbow or liberal nationalism",9 and which could serve as a form of identity bonding of the South African nation, but does not ignore or disrespect the differences and identities of the various communities. Because all communities and individuals have a heritage, just as they all have a past, Heritage Day in South Africa is for the "all"12 and the "us" in the country. I would like to think, without wanting to provoke an enormous conceptual debate, that history should serve as a cornerstone of representative and reliable information from which heritage activities in South African education are developed and facilitated. Heritage outcomes could then serve the purpose of leading to inventive actions and/or creativity in many forms. In the process it could even allow opportunities to assemble unique information to be unlocked (by interested experts) and preserved for future generations.  Artistic expressions in all their variety. To be able then to "serve" the theme of "heritage", at least in the recently accepted South African History curriculum for schools (CAPS document), History educators will probably rely heavily on the guidance of learner and teacher textbooks. As these books can only provide direction on one theme to a limited extent, the independent-thinking History educator should explore his or her local environment and region more intensively to use the local/regional historical legacy as efficiently as possible in an educational environment. As a start, to acquaint oneself and learners on a local topic so as to reach the heritage part, in my view searching for available information on a specific local community (close by or even elsewhere) would be one of the first obligations of the educator. Because some information on local histories is not readily accessible to some History educators, I have listed several related local history articles13 on a variety of places in South Africa (see below). They are mostly written by historians or researchers in other disciplines known to be experts in a particular field or area of research. These articles are mostly based on extensive research (and thinking), and could serve as valuable points of departure to unlock a specific local past, or to present debates on the past. 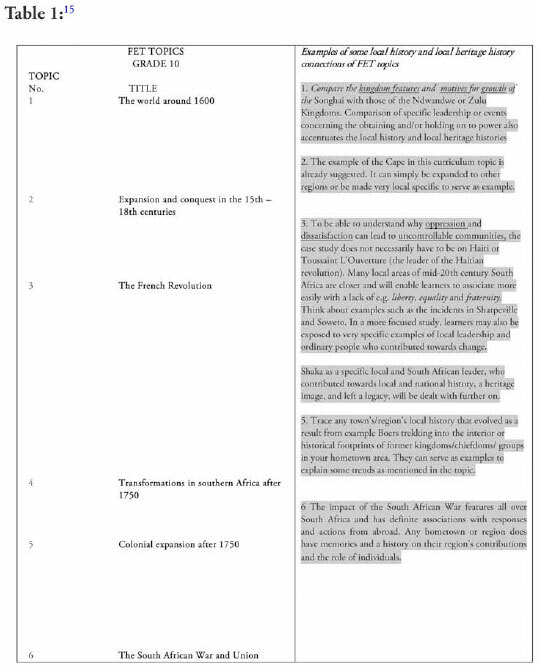 Some articles can also be used in various History curriculum themes (in a national and even international context) to provide the educator (and learners) with additional knowledge to be able to come to a more informed understanding of a theme under discussion. Once History educators have identified a few articles in the selection below that would serve their purpose, the way to obtain them would be to ask a local library to trace them through an interlibrary service or to investigate their availability through various search engines on the Internet. History societies or/and institutions that publish journals could also be approached. As a last resort the SASHT could also serve as an intermediate source to provide history educators with specific history articles or other historical information. The website www.sashtw.org.za (for subscribers) can be used for such enquiries. It is hoped that after making the effort to find sources of information on local history and local heritage in the form of articles in the four historical journals (there are more) cited here, educators will continue their research in other publications and books and use the information for its educational and historical value. Selections of history articles are given below which appear in four well-received journals on South African history (although they are by no means "complete sets" of local history and local heritage history). They are valuable sources of information on local history and local heritage history. The hope is that History educators will consider using those articles that they find informative for explaining the context of a particular theme, or will consider using the content in practical local history or heritage excursions as views or perspectives. - H Giliomee. Democracy and the frontier. A comparative study of Bacon's rebellion (1676) and the Graaff-Reinet rebellion (1795-1796), SAHJ, 6(1),1974.pp.30-51. - H Richard. Farming and politics in the Karoo, and Earstern Cape. 1910-1924, SAHJ, 12(1),1980,pp.48-64. - A Appel. Port Elizabeth, c.1855-1875: Enkele sosio-ckonomiese aspekte, SAHJ, 16(1),1984,pp.101-117. - W Dealing. Slavery and amelioration in the Oraalï-Rcinct Disrrict. 1823-1830, SAHJ, 27(1),1992,pp.75-94. - R Ross. Grahamstown versus Cape Town, SAHJ, 36(1).1997.pp.277-283. - TJ Stapleton, 'Him who destroys all': Reassessing the early career ol Faku, King ot the Mpondo, c.1818-1829, SAHJ, 38(1).1998,pp.55-78. - DW Myburgh, The origin of towns in the Eastern Cape Midlands, Contree 4. 1978,pp. 24-29. - KS Hunt. When the tailway came to Grahamstown, Contree, 6,1979,pp.24-28. - S Sampson. Fort England as a military base, Contree, 8 1980.pp.16-20. - M Rainier, Fort Donald and the Abalondolozi Regiment. Contree, 9 1981.pp.24-29. - A Appel, Aan die Grobbelaarsrivier' - 'n greep uit die vestigingsgeskiedenis van Oudtshoorn tot 1848, Contree, 10 1981,pp.9-15. - KS Hunt, The Grahamstown City Hall - The tale of two foundation stones. Contree, 10 1981,pp.27-31. - OJO Ferreira, Onder-Kouga: Oorsig van 'n kontrei. Contree, 14 1983.pp.5-16. - GL de Kock, 'n Geografiese ontleding van die eksplorasie in die sentraal-weskusgebied van Suid-Afrika, Contree 16 1984,pp.20-23. - KS Hunt. Grahamslown's Assumption Convent, Contree, 17 1985.pp.25-28. - HC Hummel, The month of August - An Annales approach to the history of Kowic, August 1881 to August 1914, Contree 18 1985,pp.18-26. - EJ Inngs. Mfengu beach labour and Port Elizabeth harbor development, 1835-1870, Contree 21 1987,pp.5-12. - JM Berning. The construction and use of Grahamstown Cathedral's towers, Contree 22 1987,pp.15-19. - S Caldwell. Segregation and plague: King William's Town and the plague outbreaks of 1900-1907, Contree 29 1991.pp.5-10. - HO Terblanche. Die Armblanke-vraagstuk in Port Elizabeth. 1916-1934: 'n Verkennende studie. Contree, 33 1993.pp.29-35. - A Mabin. Capital, coal and conflict: the genesis and planning of a company town at Indwe. Contree, 34 1993,pp.21-31. - E Nel and CM Rogerson. Incipient local economic development in the Eastern Cape. 1909-1947. Contree 37 1995.pp.1-10. - JK Coetzee and Geofrey T Wood. The struggle for democracy in the 1980's: oral accounts of political activists involved in the insurrection in Grahamstown, Contree 38 1995.pp.9-22. - OJO Ferreira. Kwaade Martha Ferreira van die Swarte Ommegang. SAJC, 4(4),Desember1990.pp.225-243. - A Heroldt. The colonial municipality: A case study of Uitenhage. SAJC, 5(3),July1991.pp.79-87. - MJ Swart & JJ Roodt. Die Port Elizabethse konsentrasiekamp. 1899-1902. SAJC, 6(2),April1992.pp.75-85. - D Radford. The early suburbs of Grahamstown: An outline of their development/. SAJC, 6(3),July1992,pp.97-104. - RC Fischer & J Booysen. Fortified frontier farmhouses: English precedent for rhe Eastern Cape. SAJC, 8(1).1994.pp.1-11. - M Burden, Volksweervoorspelling in Outeniekwa. SAJC, 8(2),1994.pp.71-78. - JC Visagie. Pieter Jacobus de Wet (1790-1843) en die voorgeskiedenis van Aliwal-Noord. SAJC, 19(2).November 2005.pp.111-126. - E.D Gerryts, 'n Geskiedenisbrokkie afkomstig van Humansdorp Historia, 3(3),1958,p.182. - R Snyman. The history of Adelaide, Historia, 7(4).1962.pp.278-281. - HO Terblanche. Die trek van die Afrikaner na Port Elizabeth. Historia. 22(2).1977.pp.90-107. - JR Heaton. The dismissal of John Mitford Bowker, resident agent amongst the Gqunukwebe and Mfengu at Fort Peddie, 1836-1839. Historia. 23(2),1978,pp.112-121. - HO Terblanche. "Louisa Meyburgh: Heldin van die Stad", Historia. 24(2).1979.pp.12-20. - FA van Jaarsweld, 'n Afrikanerperspekrief op die Groot Trek: Simbool en ritueel, Historia. 33(2).1988.pp.11-26. - HJ van Aswegen. Die vcrstcdcliking van die Nie-Blanke in die Oranje-Vrystaat. 1854-1902. SAHJ, 2(1).1970.pp.19-37. - W van der Merwe. Die Berlynse sendelinge van Bethanie (Oranjc-Vrystaat) en die Kora, 1834-1856, SAHJ, 17(1).1985.pp.40-63. - K Schoeman. Die Londense Sendinggenootskap en die San: Die stasies Toornberg en Hephzibah. 1814-1818. SAHJ, 28(1),1993.pp.221-234. - K Schoeman. Die Londense Sendinggenootskap en die San: Die stasis Ramah, Konnah en Philippolis, 1816-1828. SAHJ, 30(1).1994.pp.132-152. - K Schoeman, Die Londense Sendinggenootskap en die San: Die stasie Boesmanskool en die einde van die sending, 1828-1833, SAHJ, 30(1).1994.pp.85-97. - DB Coplan. Erasing history: The destruction of Beersheba and Platberg African Christian communities in the Eastern Orange Free State. 1858-1983. SAHJ, 61(3),2009,pp.505-520. - JC Moll. Dorpstigting in die Oranje-Vrystaat. 1854-1864, Contree. 2.1977.pp.23-28. - AC Oberholster, Parys on the Vaal, Contree, 3,1978.pp.10-14. - CC Eloff. Die sogenaamde verowerde gebied: Omstrede grensstreek tussen die Oranje-Vrystaat en Lesotho (Basoetoland), Contree, 4,1978,pp.4-24. - JWN Tempelhoff, Eersteling- Bakermat van die Suid-Aftikaanse goudmynbedryf, Contree, 9 1981,pp.5-11. - DA van der Bank. Mushroom Valley-onderstandskamp, Contree 30 1991.pp.5-9. - H van Aswegen, Grensverhoudinge in die Noord-Westelike Transgariep: die lotgevalle van die Kora tot 1858. Contree, 33 1993,pp.19-26. - P Erasmus. The 'Lost' South African tribe - rebirth of the Koranna in the Free-State, New Contree 50. 2005.pp.77-93. - SM Botes. Die ou goewermentsgebou in Bloemfontein: van regeringskantore tot letterkundige museum. SAJC, 5(4).Oktober 1991.pp.143-160. - CJP le Roux. Sandklip en sandklipkerke in die Oranje-Vrystaat. SAJC, 7(3).Junk 1993.pp.47-55. - HJ Lubbe. Die invloed van kultuur en politick op straatnaamgewing in Bloemfontein. 1946-1986. SAJC, 8(2).1994.pp.47-53. - SM Botes. Die stoommeule en bierbrouery op die tetrein van Fort Drury. Bloemfontein, 1868-1920. SAJC, 15(2).November 2001.pp.1-20. - SM Botes. Laat-Victoriaanse invloed op die intetieur-inrigting van twee van Bloemfontein se bekendste wonings. 1880-1900. SAJC, 17(1).Junk 2003.pp.115-140. - C Twala. "Ulundi-Kaya": The dwelling of Thomas Mtobi Mapikela in Bloemfontein (Mangaung) - its historical significance. SAJC, 18(1).June 2004.pp.63-79. - C Twala. The Batlokoa kingdom headquarters at Nkoe/Sefate/Poqong and Joalaboholo in the Free State Province - a forgotten history? SAJC, 19(1).June 2005.pp.119-131. - Haasbrock, Die swembadgeskiedenis van Bloemfontein. SAJC, 21(1).June,2007,pp.57-71. - P Labuschagne, 100 years of Galloway 'Boeresport' in the Free State, SAJC, 21(2),November 2007.pp.62-80. - C Twala, Winnie Mandela banishment house in Brandfort (Majwemasweu) - its historical significance, 1977-1985, SAJC, 22(2),November 2008.pp.66-85. - SF Malan, John George, Fraser: Die rol van 'n Engelstalige in die Vrystaat (1840-1927), Historia, 13(2).1968.pp.113-119. - Anon., Die gedenkposscëls van die Suid-Aftikaanse nasionale spele in Bloemfontein, Historia. 14(2).1969,pp.131-133. - C Kros, Experiencing a century in a day: Making more of Gold Reef City. SAHJ, 29(1).1993.pp.28-43. - E Delmont. The Voortrekker monument: Monolith to myth, SAHJ, 29(1),1993.pp.76-101. - RM Ralinala, Countering municipal monopoly in Mamelodi: An economic struggle, 1953-1961. SAHJ, 46(1),2002,pp.203-218. - C Dugmore. From the 'Devil's dorp' to 'Fair dorp': The transformation of Krugersdorp from a transient mining boomtown into a stable settler town. 1887 to 1905. SAHJ, 62(2),2010.pp.338-355. - S du Preez, Die eerste bewoners van kerkplein. Pretoria. Contree. 3. 1978.pp.5-9. - KSO Beavon & CM Rogerson. The persistence of the casual poor in Johannesburg. Contree, 7 1980.pp.15-21. - FJ Nöthling, Behuisingskemas vir Gekleurdes in Pretoria 1900-1924. Contree 8 1980,pp.21-31. - EJ Carruthers, The growth of local self-government in the peri-urban areas north of Johannesbutg. 1959-1969. Contree. 10 1981.pp.16-23. - T Naidoo. The temple at Melrose. Contree. 15 1984.pp.28-30. - AG Oberholster. Goudstad so byna 'n spookdorp, Contree, 20 1986.pp.8-10. - ES van Eeden. Dorpsontwikkeling in die huidige munisipale gebied van Carletonville, 1937-1948. Contree, 27 1990.pp.26-30. - A du Plessis. 'n Evaluering van staatsbetrokkenheid by die Hartebeespoortdamskema. 1914-1952. Centree. 34 1993.pp.32-38. - G Allen. F.J. Bezuidenhout's Doornfontein: A case study in white fatmland alienation on the 19th century Wirwatersrand, Contree. 36 1994,pp.15-30. - SM Malinga and G Verhoef. Housing in Daveyton and surrounding areas: History, theory and people's lives. 1970-1999, New Contree 48,2000.pp.5-26. - R van der Merwe, Changing profile: The public face of the University of Pretoria over a century, 1908-2008. New Contree. 60,2010.pp.84-112. - FA Steytler. 'n Voorttekkermonument te Pretoria. Voorstel van Pres. Kruger op 16 Desember 1888. Historia, 3(1).1958,pp.3-7. - JI Rademeyer, Omgewingsgeskiedenis met enkele verwysings na die vrocë geskiedenis van Heidelberg. Historia. 1960.pp.251-256. - JWN Tempelhoff. Blanke vestiging in die distrik Soutpansberg gedurende die negentiende eeu, met besondere verwysing na die tydperk 1886-99. SAJC, 2(4).Oktober 1988.pp.268-276. - AC van Vollenhoven. Fon Daspoortrand as deel van die fortifikasieplan van Pretoria. SAJC, 4(1).Januarie 1990.pp.8-23. - PJJ Prinsloo. Vestigingsfases in die omgewing van Vereeniging, SAJC. 9(2).1995.pp.104-124. - JS Bergh. "Die aanvangsjare van die Berlynse Sendingstasie Wallmannsthatal SAJC. 10(1).Mei 1996.pp.74-86. - PJJ Prinsloo & R van Niekerk, Aspekte van die sosiale en kulturele ontwikkeling in Vereeniging, 1892-1950. SAJC, 11(1),Mci 1997.pp.94-108. - ES van Eeden, The effect of mining development on the cultural experience of the Carletonville community, SAJC, 12(1),May 1998,pp.75-89. - A Doucakis. Begrudged, an 1847 Suikerbosrand farm name change, SAJC. 13(1).May 1999.pp.1-15. - S Badenhorst. 'n Ondersock na die oorblyfsels van die Irene-Weeshuis en -skool (1902-1907). SAJC,15(2).November 2001.pp41-60. - KA Bakker et al., The "Mamelodi Rondavels" as place in the formative period of Bantu Education and in Vlakfontein (Mamelodi West). SAJC, 17(2).November 2003.pp.1-22. - CJ van Vuuren, Ndebele place names and settlement in Pretoria. SAJC, 20(1),June 2006,pp.78-99. - LJ Louwrens, The origin and meaning of the place name Tshwane. SAJC, 20(1),June 2006.pp.100-124. - D du Bruyn, Oral testimonies as a source of community history, with special reference to the Batho project. Bloemfontein, SAJC, 24(2).November 2010,pp.1-24. - D Möller-Malan. Die donker Soutpansberg, Historia, 3(1),1958,pp.47-53. - D Möller-Malan. Die donker Soutpansberg (vervolg): Generaal Piet Joubert terug van die buiteland. Historia, 3(3).1958.pp.185-197. - JS Bergh. Die ontstaan van Pretoria se eerste Bantoewoonbuurt. Historia, 19(1).1974.pp.40-45. - AJ Potgieter. Die vestiging van swart woongebiede in en om Johannesburg. 1900-1933. Historia, 28(2),1983.pp.47-72. - MS Appelgryn, Johannesburg onder die Zuid-Afrikaansche Republick, Historia. 31(2),1986,pp.3-9. - M Hugo, Die dagboek as historiese bron - met verwysing na die dagboek van HC Bredell. Historia, 34(2),1989,pp.108-118. - I Greeff, Two Victoria Crosses near Krugersdorp, Historia. 36(2),1991.pp.17-30. - JS Bergh. Die vestiging van die Voortrekkers Noord van die Vaalrivier tot 1840. Historia, 37(2).1992.pp.38-47. - ES van Eeden. AB de Villiers, H Strydom & FJ Stoch. Effects of dewatering and sinkholes on people and environment - an analysis of the Carletonville area in Gauteng, South Africa. Historia, 48(1).2003.pp.95-125. - C Kruger and Marié van Heerden, The Voortrekker Monument Heritage Site: A new statement ot significance. Historia, 50,2,November.2005.pp.237-260. - B Surendra, The Tolstoy farm: Gandhi's experiment in "Co-operative Commonwealth". SAHJ, 7(1).1975.pp.88-100. - CC Saunders. The Transkeian Rebellion of 1880-81: A case-study of Transkeian resistance to white control, SAHJ,	8(1).1976.pp.32-39. - CA Hamilton, 'An appetite for the past": The re-creation of Shaka and the crisis in popular historical consciousness, SAHJ, 22(1),1990,pp.141-157. - J Laband, British boundary adjustments and the uSuthu-Mandlakazi conflict in Zululand. 1879-1904. SAHJ, 30(1),1994.pp.33-60. - P Jolly. Interaction between South-Eastern San and Southern Nguni and Sotho communities c. 1400 to c. 1880, SAHJ, 35(1),1996,pp.30-61. - B Guest. The KwaZulu-Natal regional economy in retrospect and prospect: A brief overview, SAHJ, 37(1).1997,pp.66-77. - SM Ndlovu, "He did what any other person in his position would have done to fight the forces of invasion and disruption": Africans, the land and contending images of King Dingane ('the Patriot') in the Twentieth Century, 1916 1950s. SAHJ, 38(1),1998,pp.99-143. - S Khan, "Children of a lesser God": Contesting South Indian Muslim identities in KwaZulu-Natal, SAHJ, 61(1),2009,pp.86-102. - P Ferreira, Doddington Court, Durban, Contree, 1,1977,p.28. - P Ferreira, West Street Durban 1977 (2), Contree, 4.1978.pp.30-32. - GC Cuthbertson, A new town at Uitvlucht: The foundation and development of Pinelands: 1919-1948. Contree, 6.1979,pp.5-11. - AJ Christopher, The Natal interior. Contree, 6,1979,pp.18-23. - GN Claasen, Van Nazareth tot Middcelburg. Contree, 7,1980,pp.5-10. - JB Brian. Mariannhill Monastery. 1882-1982. Contree, 13 1983.pp.27-30. - RF Harwell. Greytown: A South African townscape. Contree. 14 1983,pp.17-19. - A de V Minnaar, The establishment and growth of Empangeni. Contree 15 1984.pp.5-19. - RF Harwell and RW Brown, Voorttekker Pieter Mauritz Burg. Contree 16 1984,pp.16-19. - A de V Minnaar. Richardsbay. Contree 17 1985.pp.5-14. - AL Muller. Coastal shipping and the early development of the Southern Cape, Contree 18 1985.pp.5-9. - A de V Minnaar. Nagana. big-game drives and the Zululand game reserves (1890's-1950's). Contree 25 1989.pp.12-21. - A de V Minnaar. Melmoth - the first ten years (1888-1898). Contree 26 1989.pp.26-33. - C Hummel, Some reflections on the history of Port Alfred in the aftermath of World War II, Contree 35 1994,pp.1-10. - J Tayler, Building railways and "building character": the model villages in Northern Natal. Contree 35 1994,pp.32-38. - NT Sambureni. 'Listen whiteman, you have launched a war you cannot win: forced removals and the outbreak of riots in Natal, 1959-1963. Contree 38 1995.pp.23-29. - TJ Stapleton, Gathering under the Milkwood tree: The development of Mfengu tribalism in the Eastern Cape(1878-1978). New Contree, 41 1997,pp.207-218. - FA van Jaarsweld & GD Peckham. New historical perspectives on the Raphia Palm Monument at Mtunzini, SAJC, 3(2),April 1989.pp.77-82. - G Mersham. The discourse of the historical television drama - the case of 'Shaka Zulu'. SAJC, 5(2).April 1991.pp.70-77. - G Mersham, History, television and Shaka Zulu. SAJC, 5(1).January 1991.pp.10-19. - US Küsel. Die Hermannsburgse sendelinge en hulle nageslagte in Suid-Afrika. SAJC, 6(4).September 1992.pp.134-142. - H Smit, Die bergpasse wat Mosselbaai met die Klein-Karoo verbind - 'n historiese oorsig. SAJC, 21(2),November 2007.pp.139-158. - JN Brink. Die prestasies van die Zoeloe-agterryer Jonas san Touder. Historia, 3(1).1958.pp.61-62. - Anon., Die eerste blankes in Natal met spesiale verwysing na die Farewell-Tsjaka-ootcenkoms. Historia, 9(2),1964.pp.129-135. - GS Nienaber. Ou kerkgeboue in Natal. Historia, 11(2).1966.pp.120-124. - IM Perert. Tour of historical sites in Natal and Zululand: Natal Educational Activities Association. Historia, 11(4)1966. pp.267-272. - SJ Maphalala, The story of compensation, silver and bronze medals for the Zulus after the Anglo-Boer War. Historia, 24(2).1979.pp.26-31. - Anon., Die gedenkskrif van Anna Elizabeth Retief. Hiaorii. 12(4).1967.pp.265-275. - Anon., "Die Voortrekker Uys-familie vanaf 1704. Historia, 12(4).1967.pp.276-279. - FJ du Toit Spies. Onsekerheid in verband met die Gelofre van 1838, Historia, 33(2).1988.pp.51-62. - S Morrow, Heritage and historically Black universities (HBU's): the view from Fort Hare". Historia, 47(2),November 2002.pp.446-456. - JC van der Walt, Zululand true stories, 1780-1978. (Richardsbaai. 2007). Historia, 52(2).November 2007.pp.311-312. - JWN Tempelhoff and H Nemudzihadi. Riding the storm: Makhado. Venda and the nineteenth century South African Republic (1864-1895), New Contree, 45.1999.pp.101-116. - JA van Schalkwyk. Visuele kommunikasiemiddele: Die kleredrag van die Molepo/(Visual means of communication: The clothing of the Molepo). SAJC, Ou reeks 3(2),Julie 1986.pp.17-22;42. - JCA Boeyens, Nuwe lig op die uitleg van Schoemansdal/ (New light on the layout of Schoemansdal). SAJC, 1(2),Junie 1987.pp.182-186. JA van Schalkwyk, Die kultuuthistoriese betekenis van die Berlynse sendingstasies in die Blouberg-omgewing. Noord-Transvaal/(The Berlin Missionary Society in the Blouberg area of the Northern Transvaal). SAJC, 4(4).Desember 1990.pp.244-249. - M Naudé. Oral evidence on the construction of vernacular farm dwellings in the Waterberg (Limpopo Province), SAJC, 18(1),June 2004,pp.34-62. - R Donaldson & I van der Merwe. Apartheid urban development and transitional restructuring in Pietersburg and environs. Historia, 45(1).May 2000.pp.118-134. - A Mabin & G Pirie. The township question at Pilgrims Rest. 1894-1922. SAHJ, 17(1).1985,pp.64-83. - RTJ Lombard, Torbanite - 'n dorp te koop, Contree, 9 1981.p.30. - JWN Tempelhoff. Komatipoort: Oostelike poort van Transvaal, Contree 11 1982,pp.5-18. - C de Jong. Dullstroom. 1884-1984, Contree, 17 1985,pp.29-30. - GH Pirie. Public administration in Pilgrims Rest. 1915-1969. Contree 19 1986,pp.27-32. - L Wichmann, The diary of Gladys Isabel Barry: Pilgrim's Rest 1915-1930, SAJC, Old series 1(2),July 1984,pp.8-10;15. - JW Abrie. Korrespondensie: Die familie Joubert, Elandspruit, distrik Lydenburg. SAJC, 3(1),Januarie 1986,p.45. - C van Wyk, Die Campbell-watermeul op Pelgrimsrus/(The Campbell water-mill at Pilgrim's Rest), SAJC,(Old series),3(2),Julie 1986,pp.43-46. - C Plug, Early scientific and professional societies in the Transvaal: Barberton 1887-1889, SAJC, 4(3),July 1990,pp.190-199. - C Plug, Early scientific and professional societies in the Transvaal: Barberton 1887-1889. SAJC, 4(3).July I990.pp.190-199. - JFT Bartmann. Woningbou in Pelgrimsrus (1873-I971), SAJC, 4(4).Desember 1990,pp.203-215. - JFT Bartmann. Pelgrimsrus en die Anglo-Boereoorlog (1899-1902), SAJC, 5(2),April 1991.pp.41-51. - I Plug & C. Van Wyk-Rowe, The recent past in bone: Faunal remains from the kitchen middens of an early 20th century residence. Pilgrim's Rest. SAJC, 8(2).1994,pp.43-46. - M Naudé, Vernacular stone buildings and structures on farmsteads in the southern districts of the Mpumalanga Province, SAJC, 14(2),November 2000,pp.31-63. - AC van Volllenhoven & AJ Pelser. The re-assessment of the Albasini ruins, Kruger National Park, South Africa, SAJC, 23(2).November 2009.pp.99-126. - DW Hoffmann, Die magasyn op Lydenburg Historia, 3(3),1958,p.1. - MD Steyn, Gedenksaaltjie op Middelburg, Transvaal. Historia, 7(1).1962. - Anon., Uit die briewe van Antony de Vletter, huisonderwyser, staatmakcr, in diens van die 'Nieuwe Republiek', wildjagter, gouddelwer, eerste onderwyser en posmeester van Dullstroom, 1882-1888, Historia, 7(2),1962,pp.106-120. - AP van der Merwe, Plaastoekenning en plaasname in die omgewing van Ohrigstad en Oos-Transvaal, Historia, 9(1),1964.pp.53-58. - F Malunga. Foreign African migrant labour at the Messina copper mines. Historia, 47(1),2002.pp.270-290. - JA du Pisani & JJ Hugo, 'n Hongaarse entrepreneur, in die ZAR: AH Nellmapius se vervoerskema na Delagoabaai. 1874-1983. Historia, 52(2).November 2007.pp.83-111. - JJ Marais, Carnarvon: Oorsig van die geskiedenis van die dorp en distrik. Contree, 1.1977,pp.16-20. - E. Immelman. Die St John-Anglikaanse Kerk, Victoria-Wes, Contree, 1,1977.p.29. - JCS van der Merwe. Vanwyksvlei: 'n Streekshistoriese skets, Contree, 6,1979,pp.12-17. - PHR Snyman. Ontstaan en groei van Postmasburg. Contree, 13,1983,pp.4-26. - PHR Snyman. Daniëlskuil - Die tronk mite. Contree, 17.1985.pp.21-24. - PHR Snyman. Die Langeberg-Rebellie en die totstandkoming van Olifantshoek. Contree, 19.1986.pp.16-26. - PHR Snyman, Die rol van sendelinge, die owerheid en ekonomiese faktore in die ontstaan van Kuruman, 1886-1913. Contree, 22.1987.pp.5-14. - M Broodryk. Die ontwikkeling van Boesmanland gedurende die negentiende eeu, Contree, 30.1991,pp.29-35. - A Mabin. Visiting our urban past: the Kimberley mine and Pilgrims Rest Museums. Contree 36.1994,pp.31-41. - JJ Oberholster & B Humphreys, Die Campbell Sendingkerkie. Historia, 6(4),1961,235-248. - JEH Grobler. Jan Viljoen, the South African Republic and the Bakwena. 1848-1882. SAHJ, 36(1),1997.pp.240-255. - F Morton, Cattleholders. Evangelists and socioeconomic transformation among the BaKgatla of Rustenburg district, 1863-1898, SAHJ, 38(1),1998,pp.79-98. - JG Orford, A street called boom - Some glimpses of pioneer Klerksdorp. Contree, 2,1977.pp.14-16. - GN van den Bergh, Machaviestat 1839-1889: Potchefstroom se eerstc swart woonbuurt. Contree, 34 1993,pp.1-10. - J Bottomley, The death of trooper Alexander Aberline, F Squadron, NSW Imperial Bushmen at Lichtenburg 2 October 1900, New Contree, 50,2005.pp.59-75. - T Graham. Boschdal, Robinson, and Schoch: A triad out of Rustenburg/(Boschdal, Robinson en Schoch: 'n Rustenburgse drietal). SAJC, 1(2),June 1987,pp.156-162. - CJ van Vuuren. Die Hoëveldboer en die Ndebelestamskool. SAJC, 1(2).Junie 1987.pp.163-169. - EL Buys. Die kommersiële drukkers- en uitgewersbedryf in Potchefstroom (1857-1902). SAJC, 4(2),April 1990.pp.88-95. - GN van den Bergh, Die watermeulens van Potchefstroom. 1874-1888, SAJC, 7(4).September 1993.pp.87-99. - WJ Pretorius, Totemism and historical development of poetry in the Sotho languages with special reference to the Kwena totem. SAJC, 21(2).November 2007.pp.43-61. - ES van Eeden. & PJJ Prinsloo, Buisfontein: 'n Ryke pionierserfenis vanmeleë as toekomstige toeriste-aantreklikheid. SAJC, 22(1).Junie/June 2008.pp.1-22. HM Rex, Die Kruger-huis op Boekenhoutfontein. nr 336, Distrik Rustenburg. Historia, 1(1),1956.62-76. - P de Klerk, Streeksgeskiedskrywing en koloniale verhoudinge: Die Wes-Kaapse platteland en die Karoo, New Contree, 58.2009,pp.1-37. - D Sleigh. Die naam van Constantia/(The name of Constantia). SAJC, Ou reeks 2(2),Julie 1985.pp.4-7. - J Walton, Early Cape lime-kilns, SAJC, 1(1),March 1987,pp.23-25. - GL de Kock & J Brand, Historiese dorpsbeeld van Stellenbosch. SAJC, 2(1).Januarie 1988.pp.1-6. - EP Engel, Die plump dames van Stellenbosch - die simboliese betekenis van 'n wyserplaat. SAJC, 3(4).Oktober 1989,pp.333-336. - H Fransen. Die Kaapse 'preekkerk' en sy oorsprong SAJC, 3(4).Oklober 1989.pp.314-324. - PW Grobbelaar. Noordwes-Kaapse volksverlelkuns. SAJC, 5(3).Julie 1991.pp.106-112. - MHC du Preez. Die Lucas-tabak van Piketberg, SAJC, 5(4).Oktober 1991,pp.169-173. - MHC du Preez. Rachel de Beer en die spookmeisie van Uniondale. SAJC, 9(2).1995.pp.125-131. - S le Roux. Presedente vir die Kaapse moskee I [available up to series IV]: Agtergrond vir die gebou as hisioriese teks. SAJC. 10(1).Mei 1996.pp.44-59. - M Olivier. The role of the tea-table in the daily lives of rural colonial woman as observed by visitors to the Cape, SAJC, 11(1).May 1997.pp.13-26. - R Marks & M Bezzoli. The urbanism of District Six. SAJC, 11(1).May 1997.pp.48-69. - JG van der Merwe, 'n Verkenning van die vryetydsbesteding onder die Maleise slave aan die Kaap. SAJC, 11(2),November 1997,pp.23-29. - JT Kemp. Greylon - a unique Overberg village. SAJC, 14(1),June 2000.pp.41-66. - S le Roux. Vryknegte in die Kaapse boubedryf. SAJC, 14(2).November 2000.pp.64-82. - RA Laing. Stained glass at the Cape during the DEIC period, SAJC, 15(1).June 2001,pp.74-84. - JT Kemp, The oak tree in history and its legacy in the Western Cape. SAJC. 16(2).November 2002.pp.66-93. - L Rabe. Taal as identiteit - Die "Duitsc" Afrikaanssprekende gameenskap Philippi, SAJC, 17(2),November 2003,pp.46-68. - F Fairer-Wessels, A literary pilgrimage to Robben Island as inspired by Nelson Mandela's Long walk to freedom. SAJC, 9(2).November 2005.pp.1-16. - H Claassens & F Pretorius, Die bydrae van Jan van Riebeeck tot die verskeidenheid groente en vrugte aan die Kaap. 1652-1662. SAJC, 20(2).November 2006. - G Groenewald, Slavery and the church in the Stellenbosch district during the eighteenth century, SAJC, 24(2),November 2010.pp.25-36. - L Rabe. Living history - the story of Adderley Street's (lower sellers, SAJC, 24(1),June 2010.pp.83-104. WJ de Kock. Slaves and slave regulations at the Cape: 1806-1834. Historia, 3(3).1958. - NA Coetzee, Jacobus Coetsee: Die boerepionier van Groot Namakwaland. Historia, 3(3).1958,pp.169-178. - M Boucher, Ex Glande Quercus, Bishop Griffith at the Cape: The Catholic background (1803-1837) and the first frontier 'visitation' of 1838, Historia, 11(4),1966.245-255. - M W Spilhaus. The story of Ryk Tulbach III. Historia, 17(1). 1972. pp. 4-11 [Editions I-II are not cited but can be retrieved in earlier Historia editions]. - C Pretorius. Die verhaal van Anna Marais en die slaaf Claas van Bengalen. Historia. 24(1),1979.pp.42-49. - M Boucher. The voyage of a Cape slaver, Historia, 24(1).1979.pp.50-58. - A Appel. Die ontginning van die inheemse houtbosse op die Kaapse Skiereiland, 1652-1795. Historia 22(2).1977.pp.141-151. -J Raubenheimer, Die Hugenote-gedenkgebou, Koningin Victoriastraat 48. Kaapstad. Historia, 25(1).1980.pp.28-31. It is noticeable that a very limited number of articles have been written on the local history and heritage of some of the provinces. To find out why this is so would require time and space, and would be part of another whole debate on the need for more local history research. Perhaps an argument could be made that some of the articles suggested above may be very outdated and only serve to discuss a particular group. However, there is not sufficient reason to ignore them, as they are valuable for understanding and explaining local histories and aspects of heritage. History should thrive on multiple perspectives to help readers to come to an informed understanding of events. Avoiding some perspectives in some articles can just lead to another way of becoming one-sided or ignorant. Creative educators may wish to explore other sources that contextualise heritage and the heritage history of some groups in South Africa in a national or wider context. In this regard a few articles have been identified from the aforementioned journals that may be of value. - C Kross. Tokens of the past? SAHJ, 29(1).1993,pp.3-4. - TA Dowson & JD Lewis-Williams, Myths, museums and Southern African rock art, SAHJ, 29(1),1993.pp.44-60. - A Ncttleton. Arts and Africans: Hierarchies of material culture. SAHJ. 29(1).1993.pp.61-75. - J Deacon. Archacological sites as national monuments in South Africa: A review of sites declared since 1936, SAHJ, 29(1),1993.pp.118-131. - V Bickford-Smith & R Mendelsohn, Film and history studies in South Africa revisited: Representing the African past on screen, SAHJ, 48(1).2003.pp.1-9. - D Morris. Rock art as source and resource: Research and responsibility towards education, heritage and tourism, SAHJ, 49(1).2003.pp.193-206. - S Marschall, "Transforming the landscape of memory: The South African commemorative effort in international perspective". SAHJ, 55(1),2006,pp.165-185. - A Grundlingh, "Revisiting the 'Old' South Africa: Excursions into South Africa's tourist history under Apartheid, 1948-1990", SAHJ, 56(1),2006,pp.103-122. - A van der Vlies. 'Local' writing. 'Global' reading, and the demands of the 'Canon': The case of Alan Paton's Cry. the Beloved Country. SAHJ, 55(1).2006.pp.20-32. - H Ludlow, Using local history to apprentice undergraduate students into the practices of the histotian. SAHJ, 57(1).2007,pp.201-219. - S Marschall. "Pointing to the dead: Victims, maityrs and public memory in South Afiica". SAHJ, 60(1).2008, pp.103-123. - BB Maaba. Challenges to repatriation and preservation of tangible heritage in South Afiica: Black art and the experiences of the Ifa lerthu Foundation. SAHJ, 60(3).2008.pp.500-513. - T Simpson. 'Umkhonto we Sizwe. We are waiting for you: The ANC and the township uprising. September 1984 - September 1985. SAHJ, 61(1),2009.pp.158-177. - Mark Ingle, Community-based conservation: Intrinsic versus extrinsic values. New Contree, No.51(May 2006).pp.115-131. - JC Moll. Drie Suid-Afrikaanse provinsies kry 'n Afrika aanskyn: Die motiewe vir en proses van naamsverandering van Gauteng, Limpopo en Mpumalanga ('n koerantstudie). New Contree 52,2006,127-147. - AE Duffey, Ruiteimonumente in Suid-Afrika, SAJC, Ou reeks 1(1),Januarie 1984,pp.28-30. - PH Kapp. Onlstaan en ontplooiing van die Afrikaanse kultuur I. SAJC, Ou reeks 1(2).Julie 1984.pp.27-30. - PH Kapp. Ontstaan en ontplooiing van die Afrikaanse kultuur II, SAJC, Ou reeks 2(1),Januarie 1985,pp.11-13. - J Claassen. Functional and symbolic use of domes and arches in some examples of South African religious architecture, SAJC, 1(2),June 1987,pp110-120. - J Grobler, Ontspanning in die Suid-Afrikaanse swart gemeenskap: 'n Kultuurhistoriese perspektief, SAJC, 1(4),Desember 1987.pp.321-337. - GJ Nieuwoudt, Leuses van Transvaalse skoolwapens, SAJC, 4(2),April 1990,pp.102-105. - GG Cillié, Afrikaanse liederwysies - 'n besondere erfenis. SAJC, 5(1).Januarie 1991.pp.19-28. - D Radford. The carriage house and stables in South African domestic architecture. SAJC, 5(4),October 1991.pp.135-142. - PW Grobbelaar. 'Wat maak oom Kalie daar? ': Die verhaal van 'n volksdeuntjie. SAJC, 6(3).Julie 1992.pp.112-117. - SJ Jooste. Die betekenis van die Britse regimentsorkeste vir die Suid-Afrikaanse musieklewe van die negentiende ceu. SAJC, 9(1).1995.pp.38-48. - RC Fischer. Three iconologies of the boer dwelling, SAJC, 10(1).May 1996.pp.31-43. - LA Changuion. Die lewe in die Groenpuntkrygsgevangekamp rydens die Anglo-Boereoorlog, 1899-1902, SAJC, 10(2),November 1996.pp.55-71. - CJ van Vuuren. Horses, carts and taxis: Transportation and marginalization in three South African communities. SAJC, 13(1),May 1999.pp.90-103. - J Hattingh & A Wessels, Life in the British blockhouses during the Anglo-Boer War, 1899-1902, SAJC, 13(2),November 1999.pp.39-55. - AC van Vollenhoven, Die kenmerke en herkoms van die volkslied, Sarie Marais, SAJC, 14(1),Junie 2000,pp.92-109. - A van Vollenhoven & JW van den Bos, 'n Eerste fase ondersoek na die Britse blokhuisstelsel van die Anglo-Boereoorlog (1899-1902) in die Transvaal (Zuid-Afrikaansche Republiek). SAJC, 14(2).November 2000,pp.94-112. - S Marshall, learning from the African vernacular: A practical application of the African renaissance?, SAJC, 15(1),June 2001.pp.1-15. - M Burden & T Weil. Die interaksie tussen Jood en Afrikaanssprekende op die Suid-Afrikaanse platteland, 1880-1950, SAJC, 16(2),November 2002,pp.94-109. - H Raath. Oorsprong van die term hartbeeshuis. SAJC, 17(2),November 2003.pp.78-94. - FP Verster, & M Burden. Die spotprente van T.O. Honiball: 'n Kultuurhistoriese waardebepaling. SAJC, 19(1).Junie 2005.pp.1-17. - FP Verster, Die strokiesreekse van T.O. Honiball: Kaspaas versus Kalie. SAJC, 19(2).November 2005.pp.72-88. - SJ Jooste. Excerpts and aneedotes of cullural-historical interest from the history of wind music in South Africa (c. 1770-1900). SAJC, 19(2),November 2005,pp.89-110. - H Haath. Oorsprong van die Suid-Afrikaanse bootvormige hartbeces- of dakhuis. SAJC, 19(2),November 2005,pp.168-189. - WJ Pretorius, Wedersydse kulturele verryking in die ontwikkelingsgang van Afrikkans en die Afrikatale in Suid-Afrika. SAJC, 22(1),Junie 2008,pp.85-111. - J Strauss, Die skoolmuseum. Historia, 3(1).1958.pp.54-56. - JH van den Berg, 'n Interessante sportsoort uit die ou dae. Historia, 4(2),1959,p.137. - AAJ van Niekerk. Pogings om 'n klaskamermuseum vir Geskiedenis op te bou. Historia, 6(1),1961.pp.51-54. - Anon., Historiese gedenkwaardighede. Historia, 10(1).1965,pp.35-40. - DC Grobler, Die Long Toms. Wat het van hulle geword?, Historia. 10(3),1965.pp.186-191. - E Miles. Die Skilderwerk van Maggie Laubser. Historia, 10(3).1965.pp.192-200. - SH Pelissier, Die graf van Antjie Scheepers. Historia, 10(4),1965,pp.293-298. - R van Graan. Die werk van David Canty en die plek daarvan in die Suid-Afrikaanse landskapskilderkuns. Historia, 13(1).1968.pp.47-54. - SH Pelissier. Die graf van Isak leeuboud. Historia, 13(3).1968,pp.192-197. - M & E Schoonraad. 'n Ontluikende kunstenaar. Walter Westbrook, Historia, 13(3),1968,pp.198-202. - FA van Jaarsveld. 'n Feeslied, gedig in die jaar 1838. Historia, 13(4)1968.pp.246-248. - M Schoonraad. Dr JH Pierneef: Biografiese skets en sy belangstelling in die rolskuns. Historia, 14(2),1969,pp.118-130. - EP Engel, Die skilderye van Boudin	in Suid-Afrika, Historia, 18(3),1973.pp.195-199. - CAR Schulenburg, Boerekrygsgevangenes van Bermuda II: Begrafplaas op eiland, Historia, 24(1).1979.pp.20-41. - SM Ndlovu, Heritage routes for the liberated South Africans: using oral history to reconstruct unsung heroes' and heroines' routes into exile in the 1960s, Historia, 47(2),November 2002,pp.479-510. - G Allen. "The case of the volkscustodian and the professor: heritage versus history". Historia, 47(2),November 2002,pp.399-420. - C Kross, Heritage vs history: the end of a noble tradition? Historia, 48(1),2003.pp.326-336. Occasionally history journals that mostly focus on South African history also publish research on other areas in southern Africa because of the interconnectedness of the histories of neighbouring countries. A few research articles have been found in (he four history journals, bur more could probably be identified in other journals covering Africa and specifically southern Africa. - DN Beach. The Adendorff Trek in Shona History. SAHJ. 3(1).1971.pp.30-48. - T Keegan. The dynamics of a South African kingdom: Nineteenth century Lesotho reassessed. SAHJ, 30(1).1994.pp.109-120. - AB Smith, The Kalahari Bushmen Debate: Implications for Archaeology of Southern Africa, SAHJ, 35(1),1996,pp.1-15. - J Wright, Sonqua, Bosjesmans, Bushmen, abaThwa: Comments and Queries on Pre-Modern Identifications. SAHJ, 35(1),1996,pp.16-29. - EA Maré. Batalha as 'n heilige plek (Batalha as a sacred place), SAJC, 3(2),April 1989.pp.93-108. - Anon., Discovery of the Zimbabwe ruins. Historia, 9(2).1964.pp.126-128. - GC Mazarite, "Oral traditions as heritage: the historiography of oral historical research on the Shona communities of Zimbabwe. Some methodological concerns". Historia, 7(2).November 2002.pp.421-445.  JD Snowball & S Courrney, Cultural heritage routes in South Africa: Effective tools for heritage conservation and local economic development, Development South Africa, 27(4),210,pp563-576.  S Marshall, Reordering the past: Monuments and architectural heritage in Post-Apartheid South Africa, Repenser les limites : l'architecture à travers l'espace, le temps et les disciplines, Paris, INHA (« Actes de colloques »), 2005. Available at: http://inha.revues.org/1691 of Collections électroniques de I'INHA.  Ciraj Rassool, 'The rise of heritage and reconstitution of history in South Africa', Kronos. Journal of Cape History, 26,(2000),1-21.  The Yesterday&Today, from 1981 as "Gister en Vandag/Yesterday and Today" also hosts a number of heritage related articles.  Transformations in southern Africa after 1750 (the example of Shaka later in this discussion was developed from this topic).  Colonial expansion after 1750. 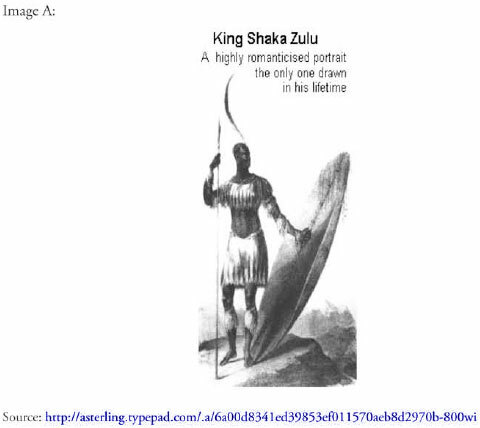  How has Shaka been portrayed - past and present (or representations of Shaka)?  What sources/evidence are there for our histories of Shaka?  Why was Shaka portrayed in this way? These questions have been raised because in the last thirty years or so the statue of Shaka still sparks interest among South Africans, the Zulu people in particular, and many others worldwide who have an interest in the AmaZulu kingdom and its history. By 2010 the perception was that Shaka's image is still well recognised, as he has for years been idolised in a popular film and through a wide variety of other media.16 2 His image as a person has also been honoured by naming places and buildings after him. Among others there are the uShaka Marine World - an aquatic theme park that opened in 2004 in Durban - and the King Shaka International Airport at Durban which opened in May 2010. In the new CAPS History curriculum for Grade 10, which deals specifically with this local and regional history, including its interconnectedness with South Africa and southern Africa's history, educators are challenged to consider past and recent interpretations of the history of Shaka's leadership of the AmaZulu. Also to be valued is Shaka's image as it relates to heritage and legacy histories, such as his image in individualistic thinking and/or various artistic expressions, which may or may not complement the most recent historical research, but which still rely on selective or perhaps skewed past memory. One example that could provoke an interesting debate, considering recent historical research, combined with perceptions of Shaka's image created by observers, past writers and oral tradition, is the dismantling of the sculpture of Shaka just weeks after its unveiling in May 2010 at King Shaka airport in Durban. To my mind this outcome also requires extensive debate by practitioners of history and institutions and groups concerned with preserving the country's heritage. It was mentioned earlier that heritage mostly appears to be in motion and is not fixed (this implies that it can be a heritage built on informed/uninformed or skewed/transformed images or expressions of a specific past). I would like to repeat that the "acknowledgement" of heritage in formal history education could and should rather be used as human experiences (we may even add perceptions) that support the making of any history, or as a tool contributing to the understanding of expressions of the broader past that feature tangible and intangible heritage. Acknowledgement of the variety of expressions we categorise as heritage also leads to other debates on human rights, such as the right of expression and to what extent any form of political ideology can interfere or intervene. For the purposes of our example, the focus will be on the dismantled sculpture which is a tangible heritage expression of King Shaka, respected as a leader of the AmaZulu in present-day KwaZulu-Natal. A few newspaper reports are provided below as sources of expressions of the representativeness of the 2010 Shaka sculpture on Shaka as a leader. Excerpts from recent research by historians are also provided (and should be further explored) to support a more informed and deliberated point of view. 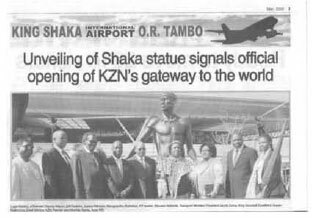 A very interesting recent portrayal was the unveiling of a sculpture of Shaka on 8 May 2010 at the new King Shaka International Airport in Durban (35 kilometres north of the Durban city centre at the request and with the funding of the Dube Trade Port close to the airport. The sculpture was created by Andries Botha. The bronze sculpture of King Shaka without a spear is accompanied by sculptures of Nguni cattle, which therefore differs from past images of Shaka as an intrepid, merciless warrior. Botha thus dropped the previous lionised image of Shaka as a warrior. Perhaps also important to note is that Botha's sculpture was created in honour of Shaka at the King Shaka International Airport. Although the statue was unveiled in May 2010 as part of the FIFA World Cup activities, the statue was dismantled on 13 June 2010 because some members of the Zulu royal house raised concerns about its true reflection of Shaka. If I were the educator of a group of Grade 10 learners, I would have developed a history assignment as well as a heritage assignment from the section on Shaka in Topic 4 of the curriculum. Of all the books written on Shaka and the Zulu, E. A. Ritter's "Shaka Zulu" (1955) is almost certainly the most widely read. It remains the only substantial so-called 'biography' of Shaka ... Historians who doubt Ritter's veracity, and quibble about his fictionalising, or who no longer wish to cite him as a source at all, unquestioningly incorporate assertions or episodes found nowhere outside "Shaka Zulu"... Ritter's use of written sources is ... extremely limited and selective, even disingenuous, and his evocation of oral traditions so dubious as to be practically useless to the historian... Ritter, while clearly working within a 'great man' paradigm of history, paradoxically attempts to decentre Shaka as cause of a sub-continental wave of violence (the 'mfecane', a term Ritter himself does not use), while lionising his nation-building personality. The defence is based partly on chronology, partly on Ritter's overriding concern to present a more sympathetic protagonist: 'by no conceivable stretch of the imagination can Shaka be blamed for the devastations' of the early 1800s; these were largely Zwide's and other 'desperadoes'" doing, while the empire builder Shaka 'destroyed only in order to rebuild'. Source: Dan Wylie, "A dangerous admiration: E.A. Ritter's Shaka Zulu", South African Historical Journal, 28(1),1993,pp.98-118. Source: Paul Maylam, "The death of the Mfecane?" South African Historical Journal, 25(1)1 1991,pp.163-166. Source: Alan Webster, "The Mfecane paradigm overthrown, South African Historical Journal, 25(1)1 1991,pp.170-172. Source: Carolyn Anne Hamilton, "'The character and objects of Chaka': A reconsideration of the making of Shaka as 'Mfecane' motor", The Journal of African History, 1992,33,pp.37-63. Source: CA Hamilton, "An appetite for the past': The re-creation of Shaka and the crisis in popular historical consciousness", South African Historical Journal, 22(1990),pp.141-157. 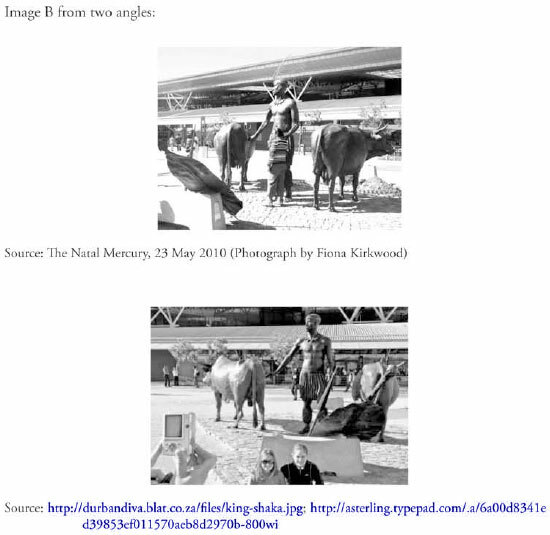 Compare the image of Shaka (see image A below) and the recent one by Andries Botha (image B) and try to find all the differences and similarities. Source: G Arde, "We could quickly fill parks with monuments to stupidity", Sunday Tribune, 6 June 2010. Andries Botha's sculpture of King Shaka is a thought-provoking, stirring and inspirational rendition that raises Shaka above the clichéd, colonial stereotype as the 'noble savage' and places this leader squarely in the vernacular of the 21st century: a Renaissance man who was a warrior in the pursuit of his dreams, yet a courageous visionary who understood that the dream is about laying down one's weapons - and was that not also the genius of Nelson Mandela? Removing this sculpture was an outrageous and tragic act of vandalism that desecrated all the cultural values in our constitution and that we upheld with suffering and sacrifice during the time of the Truth and Reconciliation Commission. Source: T Charter, "Removal of King Shaka statue an act of vandalism", The Mercury, 21 June 2010. Source: G Arde, "Boet's philosophy", News & Views, 6 June 2010. Give a one-sentence overview of the author's/creator's sentiment raised or expressed in each of the sources. List the arguments in sources A to C that you: 2.1) can associate with, and/or: 2.2) dissociate from, giving a proper motivation based on what you have learned so far in History about Shaka (1 page max.). 3.4) Members of the community. Lastly, mention that this heritage assignment can even include a visit to places associated with Shaka's childhood, his activities as a warrior and places commemorating his legacy. If travel and funding are problems, explore an example of an outstanding or disputed leadership closer to your locality, and deal with the content discussion in a similar way as was done with King Shaka. 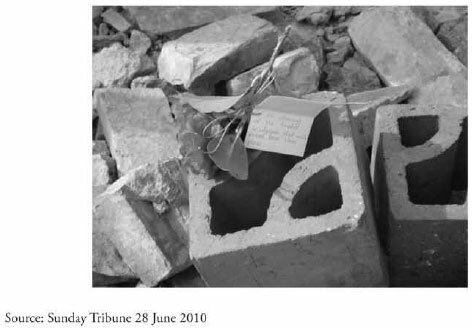 The key purpose of the discussion in this article was to remind history educators of, and introduce them to, the exciting opportunities and challenges of local histories in the knowledge, use and appreciation of heritage and history in History curricula. Several examples of local history sources, reflecting the nine provinces of South Africa, were listed to explore their content value in History curricula, and also to consider their historical value when assignments on heritage are the focus. From the possibilities offered as examples of assignments (including the questions), the hope is that History educators will sufficiently emphasise the value of extensive historical research to complement and acknowledge South Africa's heritage legacies and expressions in their tangible and intangible forms. 1 For valuable theory on heritage and debates on whether history should be associated with heritage, etc. consult, among others, the following sources: JD Snowball & S Courtney, Cultural heritage routes in South Africa: F.ffectivc tools for heritage conservation and local economic development? Development Southern Africa, 27(4),October 2010,pp.563-576; N Sheperd, "Heritage", in N Sheperd and S Robins (Eds. ), New South African keywords (Jacana, Johannesburg, 2008),pp.116-128 ; K Ronan, "Memory, place and nation-building: Remembering in the 'New'South Africa",pp.1-48, School for International Training Program, 2007 accessed from www.google.co.za as viewcontent.pdf; J Carruthers. Africa Forum on "Heritage and History", accessed from on H-Africa: http://h-nct.msu.edu/cgi-bin/logbrowse.pl?trx=vx6clist=h-africa&month=9810&week=c&msg=sv82DZpkATFzGc7zqbklFKA&user=&pw=, 20 October 1998. 2 In the context of this discussion local or regional history is recognised as the unity of all historical branches related to history. In regional history the past is studied from a local angle from above and below. Its methodology therefore also features an interest in smaller communities/individuals, their activities, experiences or/and contributions in their own environment, of which some local events also may lead to broader outcomes. Compare "Editorial": Contree: Journalfor South African urban and regional history,1(January 1977),p.3. 3 In the context of this discussion heritage is basically defined as an individual or collective memory/oral conceptions of the past as expressed in the present. There is no exact relationship of the past in the present. It can also appear as being both a point of identity and difference. See N Sheperd & S Robins (Eds. ), New South African keywords, (Jacana, Johannesburg, 2008),p.117: C Kros, Heritage vs. history: the end of a noble tradition? Historia, 48(1),May 2003,pp.326-336. 4 C Kros, Heritage vs. history: the end of a noble tradition? Historia, 48(1),May 2003,p.328. 5 Compare N Sheperd & S Robins (Eds.). New South African keywords, Jacana, 2008.p.123. 7 Compare the discussion by M Winstanley, "History and the community", in A Booth and P Hyland, History in higher education: New directions in teaching and learning, Blackwcll, Massachusetts USA, 1996,pp.207-221; H Ludlow, "Using local history to apprentice undergraduate students into the practices of the historian", South Africa Historical Journal, 57(2007),201-219. 8 This argument does not contradict the view that any country should explore ways of creating a national identity. 9 "These are conceptual expressions that academia have tossed around recently. See S Marschall, "Making money with memories: The fusion of heritage, tourism and identity formation in South Africa", Historia, 50(1),May 2005,p.118. 10 Compare K Ronan, "Memory, place and nation-building:School for International Training Program, 2007, www.google.co.za as viewcontent.pdf, p. 15; C Rassool, "The rise of Heritage and Rcconstitution of History in South Africa", Kronos, 26,2000,pp.1-21. 11 Also compare DoE, CD compilation titled, "Celebrating our heritage." Constitutional values highlighted in the manifesto on values, education and democracy. Race and values in education, Pretoria, ca 1996. 12 Compare J Carruthers, Africa Forum on "Heritage and History", H-Africa: http://h-net.msu.edu/cgi-bin/logbrowsc.pl?trx=vx&list=h-africa&month=9810&wcek=c&msg=sv82DZpkATFzGc7zqbkFKA&uscr=&pw=, 20 October 1998. 13 Although the existence of a wide variety of local history books is not mentioned here, educators should explore their local regions museums, libraries and local governments for information, lhese pieces of information can be very handy in providing a solid basis of history content for local heritage assignments. 14 The articles listed in each or the provinces are not given in any specific order. 15 The publication edited by G Curhbertson, A Grundlingh and M-L Suttie, titled Writing a wider war. Rethinki gender, race and identity in the South African War, 1899-1902 (David Phillip, CapeTown2002) should not ignored in providing additional background to a well recorded period in South Africa's history. 16 As examples see - G Mersham, Ihe discourse of the historical television drama - the case of 'Shaka Zulu', South African Cultural Historical Journal, 5(2),April 1991,pp.70-77;- G Mersham. History, television and Shaka Zulu, South African Cultural Historical Journal, 5(1),January 1991,pp.10-19.